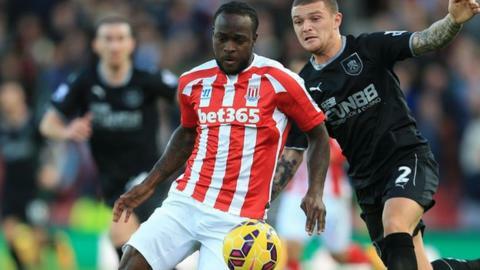 Stoke City's on-loan forward Victor Moses is facing up to eight weeks on the sidelines with a thigh injury. "It's bad news on Victor Moses, a problem with his thigh," Stoke assistant manager Mark Bowen told BBC Radio Stoke. "He will be out with anything up to six to eight weeks. It's a big hit. He had a scan and it's not good. "At the moment we're deciding with Chelsea whether to go back and have the rehab there or stay with our team." Nigeria international Moses, who joined Chelsea for a reported £9m in 2012 but spent most of last season on loan at Liverpool, has scored one goal in 12 appearances so far for Mark Hughes' side. Stoke have received better news on defender Marc Wilson, who missed Saturday's 2-1 home defeat by Burnley. "Hopefully he will be available for the weekend after more intensive treatment," Bowen said. "Our problems at the back are well documented. We had four or five players out injured on Saturday." Stoke, who are 11th in the Premier League table, travel to Liverpool on Saturday.